Noel McMeel is recognized as one of the top chefs working in Ireland today, has an impressive worldwide culinary track record, including being named “Best Chef In Ulster” a number of times and authoring “Irish Pantry” (Running Press, 2013). He has spent his entire career dedicated to a very simple goal: finding, preparing, and serving the freshest food in season. 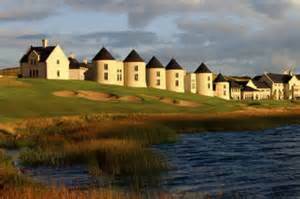 Having been chef to royalty and rock stars, his culinary skills were most recently tested in June, 2013, when he oversaw the catering for the G-8 Summit at Lough Erne (www.lougherneresort.com) and met the leaders of the world’s eight industrialized nations. 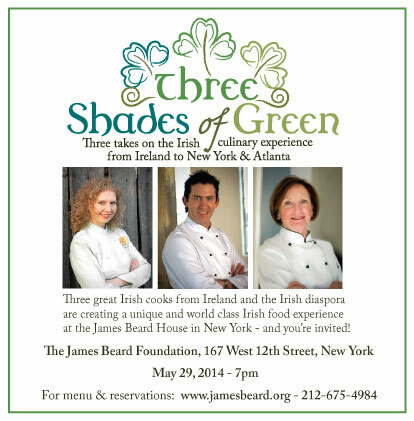 This will be his third appearance at the James Beard Foundation. I will be representing the Shamrock and Peach (www.shamrockandpeach.com) and celebrating my roots from County Armagh, where I learned the techniques of the Scots-Irish culinary tradition. My Georgia roots will be represented by my signature blending of southern food traditions with Irish techniques and traditions,with a recipe from my cook book “The Shamrock and the Peach” (Ambassador International, 2012). The author of 10 Irish cookbooks, Margaret has roots in Dublin, Kerry, and Cork, and is a skilled cook and writer who is passionate about Ireland (www.irishcook.com). As a master of distilling the best of Irish culture into the written word, her books and recipes have given Ireland and Irish food the recognition it richly deserves. Her most recent books, “Flavors of Ireland” (2012) and “Christmas Flavors of Ireland” (2013), are published by Ambassador International. Together, we are teaming up for a special dinner at the Beard Foundation, the New York-based national professional organization that serves to promote the culinary arts. Housed in Beard’s New York brownstone at 167 West 12th Street in Greenwich Village, the foundation is preserved as a gathering place where members, the public, and press can appreciate the talents of established and emerging chefs. A wee bit of tartan with me and Noel McMeel! Yes, it’s that time again when the good people of Georgia cast all sense of propriety to the wind (literally!) and don their kilts in preparation for the Stone Mountain Highland Games. Pipes, fifes, drums, haggis, clans, swords, cabers, thick white socks, bony knees, Southern men in kilts and…me, along with the very talented Chef Noel McMeel. 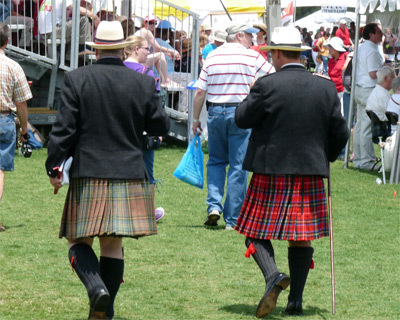 Yes, that’s what’s going on this coming weekend at the fabled Scottish fling right here in the heart of Georgia. Who would believe it? But seriously, this year I’m particularly thrilled to be there as a guest chef of Tourism Ireland and I get to hang with and cook with the incredibly talented Irish celeb chef Noel McMeel. Noel and I will be cooking up some wonderful Irish and Scots-Irish treats for visitors to the Tourism Ireland stand in the games and whilst the food vendors offer up soggy fries and horrific plastic burnt burgers we will be giving away hundreds of gourmet Irish treats, all courtesy of our friends at Tourism Ireland. 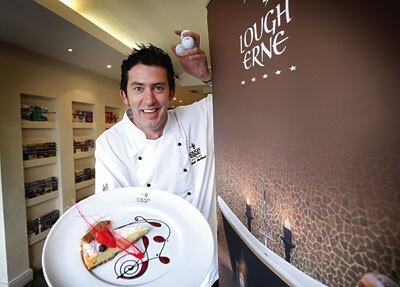 If you haven’t heard of Noel McMeel…please, please check this chef out. He is the talent behind the Lough Erne resort, home to Rory McIlroy and one of the most incredible golf resorts in Ireland. Noel is incredibly famous throughout Ireland and the UK for his inventive food presented as an artform and is a really nice guy to boot! So click below for a closer wee lookie! So, don that kilt, work on your best ‘Shrek’ impression and come and check us out this weekend!